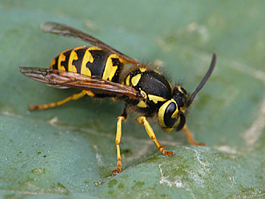 Vespid wasps such as the yellow jacket, Vespula pennsylvanica, and the baldfaced hornet, V. maculata, can occur in large number in orchards. Their potential as biological control agents is probably limited since they will feed on other natural enemies. In addition, their aggressive behavior and painful sting make them undesirable in orchards any time people are working. There are reports that large number of vespids can suppress pear psylla populations, presumably by feeding extensively on psylla honeydew, causing the death of exposed nymphs by desiccation. Using vespid wasps in an IPM program would be difficult since it would require that wasps be removed from the orchard prior to harvest.